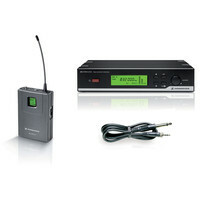 The Sennheiser XSW72 E is an affordable wireless system great for instruments allowing the user to be free on stage. This wireless system is perfect for musicians who require an easy to use all in one system that offers Sennheisers reliability and sound quality at a fantastically affordable price. Guitarists and bassists can enjoy total freedom and natural reproduction both on and off stage. The XSW72 E synchronises via RF remote channels frequencies are tunable in steps of 25kHz and has 8 frequency banks each with a maximum of 12 presets. The 1/4″ jack output makes this wireless system perfect for guitarists bassists and many other instruments. This entry was posted in Sennheiser and tagged PA-DJ-and-Lighting. Bookmark the permalink.